The app recognizes your current location and allows you to add multiple locations, as just about all decent iOS weather apps do. On its standard screen the app offers just very quick summary weather info. The name of the location, the current temperature, the current time, the expected daily high and low, wind speed, and a very brief forecast for the day. There are arrow buttons to tap to switch between locations. 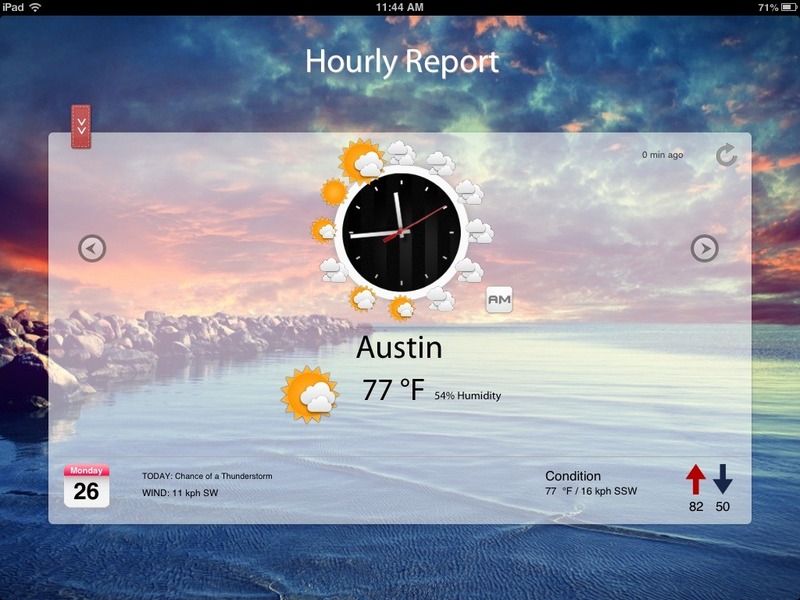 I’d rather be able to just swipe to move between locations, as you can in Weather HD and other weather apps I’ve used. 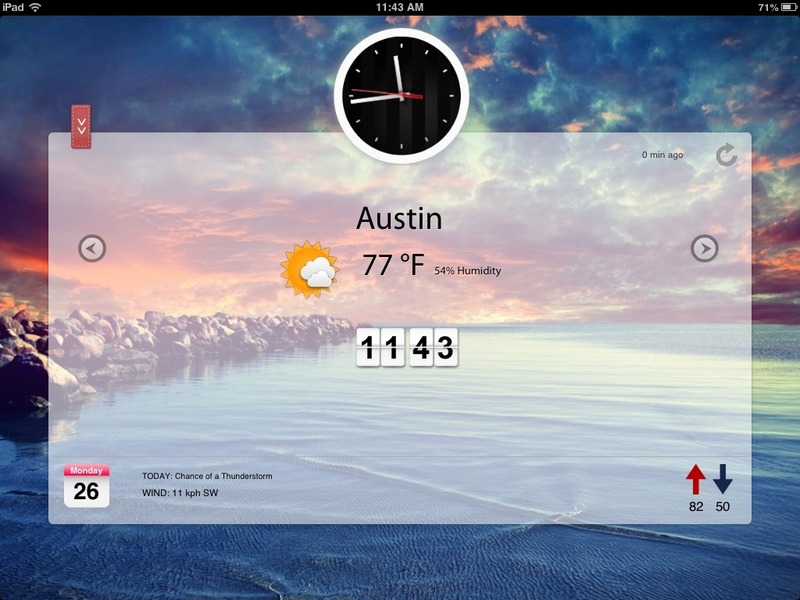 A ‘smart clock’ feature offers a minimal ‘hourly report’ – you tap on the clock and it shows sunny / cloudy / stormy icons beside each hour marker on the clock. 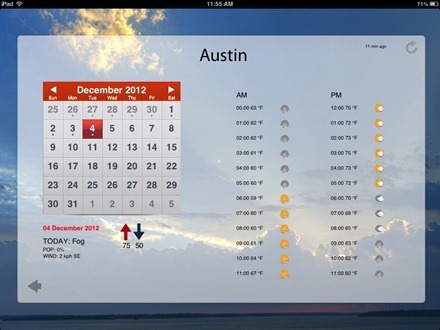 A tap on the calendar icon towards the bottom left of the screen takes you to a 9 day ‘report’ – where you can tap on dates up to 9 days ahead to see a listing of expected hourly temperatures and little forecast / conditions icons next to each hour. I don’t know that I would generally call that level of information a report. One of the app’s main selling points seems to be its simplicity. It’s described as simple, smart and beautiful. It is easy to use and the imagery it uses is decent looking – but I’d have to say it falls short of Weather HD in both areas. It also offers considerably less information, and no radar or maps at all. 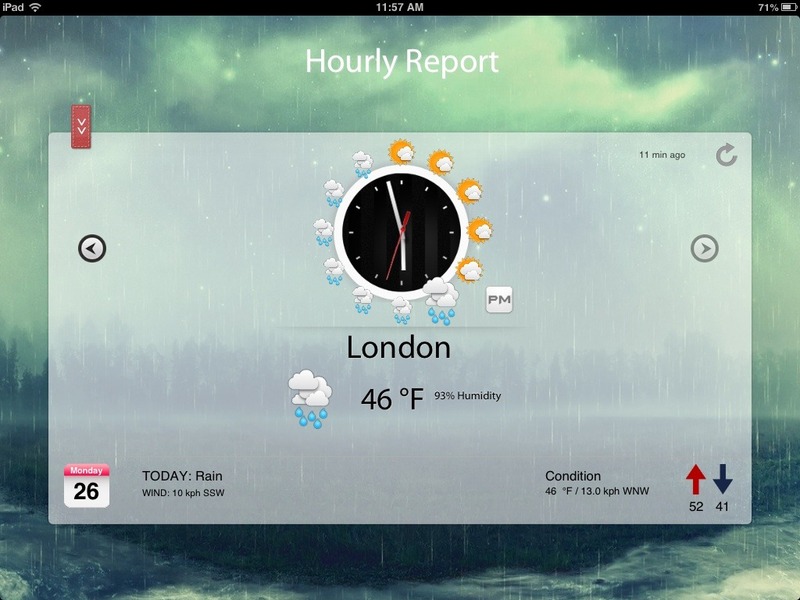 Breathe for iPad is a nice enough little app, but for me it doesn’t stack up well at all against the leading simple, elegant weather app for the iPad. Being priced at $3.99 for an iPad app only vs. Weather HD at $1.99 as a universal app for iPad and iPhone does not bode well either. Here’s an App Store link for Breathe for iPad. Disclosure: This app was independently purchased by the post author. For information on our review policies, please see the About page. I disagree with the overall premise of this post but I still think its pretty useful. I really like your writing style. Keep up the great work. It was more likely to be a review for Weather HD than a review for Breathe.